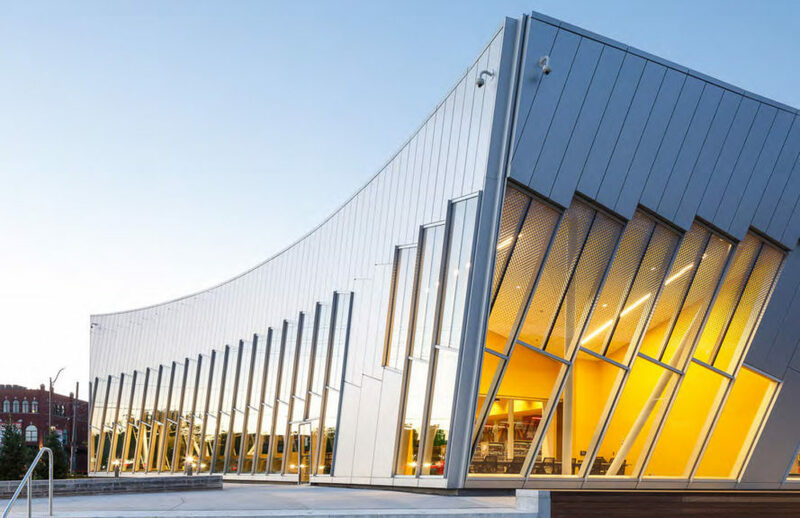 The Vaughan Civic Centre Resource Library by ZAS Architects is dedicated to helping people learn to use digital tools and 21st-century technology, and its incredible modern design reflects that goal. 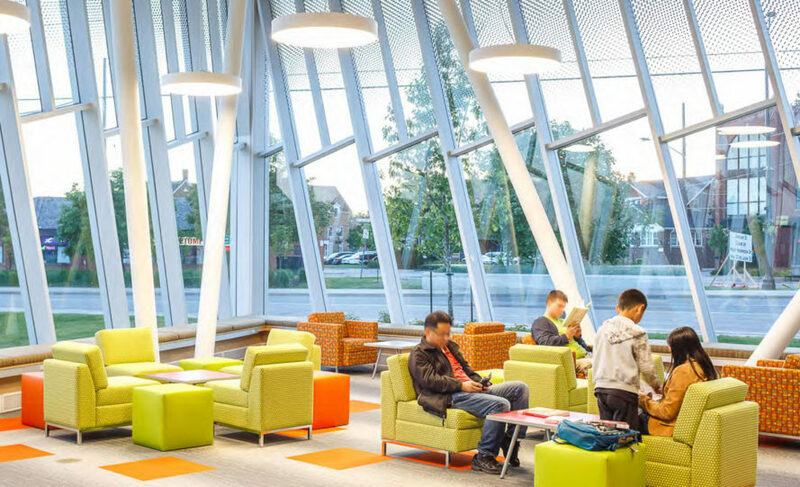 Wrapped in a sleek, translucent facade, the library acts as a "transformative community centerpiece that aims to empower local residents of all ages and demographics." The new building reconciles the different scale of Vaughan’s City Hall’s Clock tower and historic Sarah Noble/Beaverbrook House. Its reflective facade changes appearance with the light throughout the day. This ever-changing appearance references the constantly-evolving learning environment inside the building and wraps around the volume to form a central interior courtyard. To create a modern space that reflects the way new digital tools are used in learning, the architects created a flexible layout that encourages social interaction. Colorful furniture and natural lighting further animate the spaces and direct visitors to different multi-functional and collaboration spaces, meeting rooms, and lounges. An outdoor garden courtyard features a red maple tree that represents knowledge. Visitors can use computers, 3D printers, a sound recording and video studio with a green screen. The new building reconciles the different scale of Vaughan's City Hall’s Clock tower and historic Sarah Noble/Beaverbrook House. Its reflective, ever-changing facade references overlapping ideas and user groups and wraps around the volume that forms a central interior courtyard. To create a modern space that reflects the way new digital tools are used in learning, the architects created a flexible layout that encourages social interaction. Colorful furniture and natural lighting further animate the spaces and direct visitors to different multi-functional and collaboration spaces, meeting rooms, and lounges. An outdoor garden courtyard features a red maple tree that represents knowledge. Visitors can use computers, 3D printers, a sound recording and video studio with a green screen.